Our pastor, Rich Futrell, was born in Alaska and raised in Washington state. His spiritual journey is a bit atypical, maybe even sordid. He was raised Southern Baptist (he is, after all, a first-generation Yankee! ), but during his teen years, he became an athiest and was so for about a decade. After being prompted to read the Bible through circumstances in his life, he was brought back to the faith. He eventually became a Lutheran based on his reading of the Bible without his previously preconceived notions. 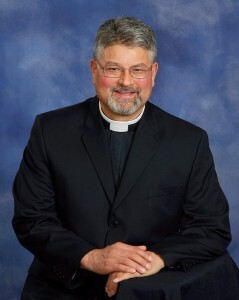 In 1988, he was catechized into the Lutheran faith. In 2003, he enrolled in seminary for 4-1/2 years at Concordia Seminary, St. Louis. He was ordained into the Office of the Holy Ministry in May 2008. At the end of June 2008, he was installed as our pastor. As our pastor, his primary duties involve preaching, teaching, and administering the Sacraments of baptism, absolution, and the Lord’s Supper. Reverend Futrell is a “second career” pastor. He served almost 22 years in the U.S. Air Force, during which time he received his Bachelor degree in history in 1995 from Georgia College and State University. In 2008, he finished his studies at Concordia Seminary. There he earned a Masters of Divinity degree. When he is not preaching the Word and administering the Sacraments, Pastor Futrell delights in spending time with his wife, Sheri. They especially delight in taking short road trips to explore new towns and areas. He also likes to exercise to help keep himself from getting too pudgy.